Get Information in the way you want it. Get Dashboards and Business summary Outlet-wise. On-premise & On-demand multiple outlets solution helps to get a centralized view of outlets stock & sales positions, aids management of multi-location COCO & COFO chains from HO. Retailers can plan for downstream supply chain management from main location, get analytics to make informed decisions and thus operate their chain stores efficiently. 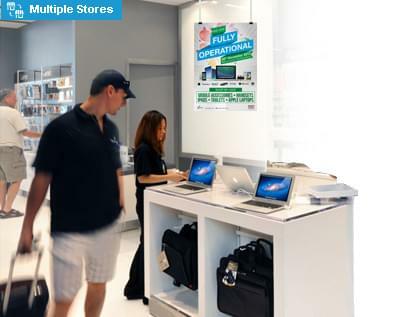 Multi-store White Goods, Chain Mobile Shop, multi-location Computer Hardware outlets, Home appliances, PC & Laptop, Consumer Electronics POS system helps in streamlining all the chain store activities from just one main location or Head office. Sign-up for 30 Days Trial download of Multi-chain Consumer Electronics stores software solution.